Hana Restaurant and Cafe Concert in Ibiza Town is a delightful concept bringing the influence of a small pacific island to incredible food and drink. On first sight, the elegant Hana Restaurant and Cafe Concert reaches out to you. The unmistakable, vibrant decoration and the illuminated vertical garden brings the corner of the street it is situated on to life and lures you in. Lush vegetation continues inside with a dense moss living wall and potted palms that surround diners. Up to 25 can be seated in the very comfortable chairs that match its golden decor in front of the open-fronted kitchen. You can also access the private club and cocktail bar next door, which is currently open to the public. Hana Restaurant and Café Concert is open all year round and is also available for private hire events. Owner Juan Dan, the former General Manager of Lío Ibiza, wanted to create something very different based on his experiences travelling to the tiny Hawaiian island of Hana. The island, which has only 1200 residents living precariously between an active volcano and the ocean, is a tropical paradise and many of its features can be found in the cuisine, the interior design and the menu. From the crockery made from volcanic ash ceramic, to the floor tiles typical of a Hana island home, to the waiters attending you in Hawaiian shirts and dresses, every attempt has been made to capture the essence of life on this Pacific island. For Juan, the music experience is very important. Every day there is live music in the club with resident DJs and musicians. We were lucky to experience, up close, the intense passion and pain of authentic flamenco while sipping our cocktails in this private, intimate space. Victor de Llao, the chef, has created an haute cuisine menu based around Juan's adventures in Hana. The cuisine is a Hawaiian/Mediterranean fusion - largely a reinvention of classic Ibiza dishes but with Hawaiian flourishes and the addition of a few South American influences too. Some of the dishes astound with their complexity while others are amazingly simple, yet delicious. 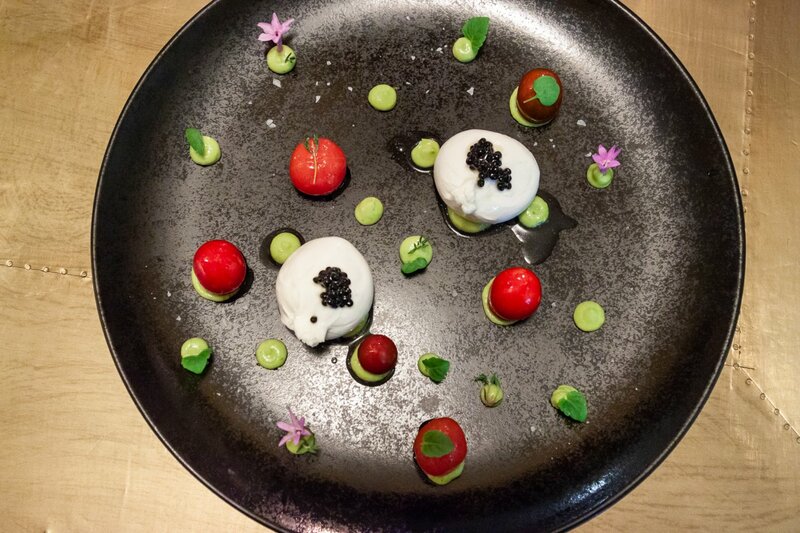 After an appetiser of tuna tartare, red prawn and truffle sauce the chef presented us with his first dish, Puna; a serving of burrata, white truffle and caviar garnished with avocado puree, garlic flowers, and three types of tomato: plum, cherry and tiger, sweetened with sugar water. This sensational reinvention of the classic tomato and mozzarella salad was the perfect introduction to the chef's creative imagination, who will also prepare food specific to the dietary needs of clients. A personal highlight was the Pele ceviche, served inside a “volcano”, with sea trout, eel, mussels, coriander, parsley, chili, guacamole, kumquat and an erupting foam infused with extremely hot Rocoto chilies. Once mixed together with the foam, the ingredients fuse to create the perfect balance between salty seafood, acidity and fire. Inspired by kitchen gardens, Paliuli is a wine box filled with a varied mix of raw baby fruit and vegetable crudités on a base of wakami. Chicory, kumquat, mushrooms, padron peppers and tiny cucumbers which resemble miniature watermelons, were among the variety of seasonal delights. When the box is opened an aromatic orange smoke escapes to arouse and heighten the senses. Another incredible dish named Mehina arrived in a moon-shaped vessel, which, when opened, revealed king crab and sea cucumber gyozas in a prawn, wasabi and sobrasada emulsion. Such creativity is a treat and was symbolized by the translucent slices of dried tuna placed on top. Much simpler but no less flavoursome was our main course of home-made pappardelle pasta served in a hollowed out Sicilian pecorino cheese. With only generous shavings of truffle as an accompaniment, this pasta made an incredibly tasty feast. To round off our meal, we finished with an indulgent serving of lemon cake with a sweet yuzu ice cream - the perfect palate cleanser to prepare for an after-dinner cocktail. Drinks are vital elements of the Hana Restaurant and Café Concert experience. The cocktail bar, designed by Juan with help from his experienced head waiter, Sergio, keeps a very good store of Spanish wines and spirits to devise its cocktails. We accompanied our meal with a full-bodied Catalan rose, Alpinista, and the ever-popular Terras Gauda Albariño from Galicia. Both wines are great for any occasion and more than held their own alongside the creative dishes. Sergio visits every table to invite diners to try a bespoke cocktail, made to their personal tastes. However, we were highly impressed the super-smooth and fruity Green Hana signature cocktail, with its smoky foam topping. It's always nice to be pleasantly surprised by new concoctions and this was a completely new taste revelation. For an exquisite selection of food made to the highest standards and drinks prepared with the finest of wines and spirits, Hana Restaurant and Cafe Concert will leave your senses mesmerised.